Adrenoleukodystrophy is a genetically conditioned, hereditary degenerative disease of the brain, associated with an insufficient function of the adrenal glands. The cause of the disease is a violation of the metabolism of fatty acids, due to a possible metabolic disorder, which leads to a genetic mutation. This disease is inherited by recessive trait, by the type of adhesion to the X chromosome. Adrenoleukodystrophy causes a genetic mutation, which is located in the long shoulder located in the long arm of the chromosome X. This gene performs the encoding of a specific enzyme, which is responsible for the processing of fatty acids of long chain structures. This reduces the oxidation of these acids, as a result of which they accumulate in the white matter of the brain, as well as in the adrenal glands. This leads to a malfunction in their functions. The process of demyelination of nerve fibers begins. The disease is inherited by a recessive trait linked to the X chromosome, that is, a woman transmits this disease, being carriers of the disease, and men are ill.
Men get sick, from an early age, when signs of adrenal insufficiency appear (Addisons disease). 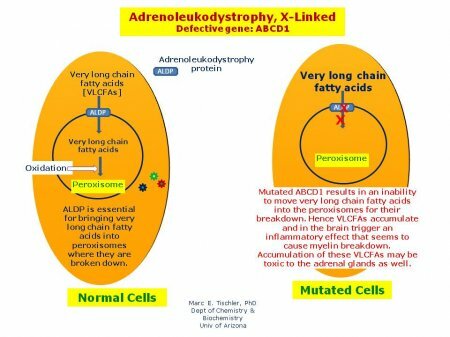 The most common form of adrenoleukodystrophy, linked to the X chromosome, is adrenomyeloneuropathy. With the development of this disease, the amount of these acids in the testicles, adrenals and brain is increased up to 1000 times. These acids enter the body through food, and are also synthesized in the body by themselves. Adrenoleukodystrophy is characterized by its selective defeat, as it is known that boys, usually aged 5-12 years, are ill. The disease ends in a fatal outcome. It mainly attacks the boys, manifests at the age of 5-12 years, ends with the death of the patient. Adrenomyeloneuropathy is usually characteristic of adolescents (boys). These diseases are accompanied by total demyelination with a violation of adrenal function. - Stimulation of adrenocorticotropic hormones. In the blood plasma (and other body fluids) fatty acids of long chain structures are found in increased amounts. This indicates the biochemical changes characteristic of this disease. As a rule, there is a decrease in the reaction to a sample with adrenocorticotropic hormones, a reduced content of cortisol in the blood. Magnetic resonance imaging and computerized brain examination are the most accurate research methods in combination with laboratory methods. Treatment of adrenoleukodystrophy is aimed at limiting the intake of fatty acids in long chain structures and hormone replacement therapy. - Special education for sick children. - In some cases, bone marrow transplantation is performed if the disease is detected early. Particularly useful is the transplantation of the bone marrow in cases of infantile cerebral palsy, as a form of manifestation of childhood adrenoleukodystrophy. Dietotherapy includes a balanced intake of protein, fat and carbohydrates. The increased intake of vitamins B1 and C is shown. Especially rich in these vitamins are dogrose, black currant, yeast. Increase the intake of table salt (up to 20 grams per day), and the amount of potassium salts is reduced to 2 g per day. Adrenoleukodystrophy is a serious hereditary disease, which leads to the development of various neurological disorders of children and adults, virtually untreatable. This disease progresses very quickly, leading to a lethal outcome after 1-4 years from the onset of the disease.